Why Geek On a Scooter? We are the local authority in computer repair, data recovery, virus removal, wireless setup, website design, and Google marketing to name a few. We add up to 20 more steps to computer tune-ups than our competition. Your will be PC faster than when it was new! We stay in touch with current technology while providing honest and dependable support. Located in Meridian, we are locally owned and operated. Boise to Nampa, Eagle to Kuna. We are there for you. Being local, we have a vested interest in the local economy. We offer Community Enrichment Discounts for Teachers, Retired, Nurse/EMT, Firefighters, Police, and Military. Located in the Boise Metro area? We will come right to your door step and pick up your computer, wherever you may be. We will even pick your computer up at your work place during lunch breaks. You convenience is one of our priorities. When we are finished we will bring it right back wherever you may be. 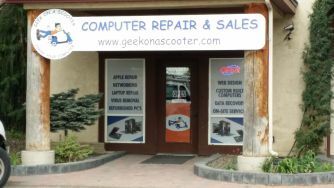 Geek On a Scooter provides a vast variety of services and products. This includes: desktop and laptop upgrades, network setup, virus removal, computer tune-up, computer repair, remote support, build websites, internet marketing. Hate Windows 8? We carry Windows 7! Offering refurbished computers with Windows 7. You want it, we can help you. The "Geek on a Scooter Team" is knowledgeable and very service oriented. I’ve already recommended them to several family members. Geek on a Scooter saved my computer! I have an almost 6 year old PC that was incredibly slow and froze frequently. I thought it was on its deathbed and that I’d have to replace it. Christian took my PC on a Thursday afternoon and by Monday morning my PC ran like it was brand new! The Geek rules! Geek on a Scooter does an awesome job at a very reasonable price. Not only did he fix the hardware problem he made this thing run so much faster than it ever had! Trust the Geek......He really knows what he's doing! Thanks Geek on a Scooter! Talk about customer service! Wow. These guys are always willing to help and in such a timely and efficient manner. My computer is like new and Christian is always willing to answer a question and help in anyway he can! Thank you for getting me up-to-speed!